Labor’s coalition partner, the Australian Greens, and their leadership aspirant Senator Sarah Hanson-Young have prescribed a dire outcome for regional Australia under the Green-Labor-Independent government. So the Princess of university lefty students has decided that we don’t need small regional towns. I know that comment is a little bit cutting but I also know what she said was totally insulting. This is the crowd that is currently running the country. These are the things they are saying. Yet they tell us a carbon tax won’t hurt. We can judge them now not only by their actions but also by their words. Every day that Julia relies on the Greens support, and she does, she endorses the Greens’ statements. What do we say to people in a small town with a mortgage Sarah Hanson-Young? What do they do, pick up their house and move? Where exactly are these green towns? I have a vision of Nimbin but that is about as far as I get. Sarah what you really mean by green jobs, is the transfer of people from boilermakers and fitter and turners into national park guides, carbon bureaucrats and Australian Taxation Officials. The effect of all this, we know from Treasury modelling, is that real wages will fall. A promise the Labor party always seem to be able to deliver on. In Sarah Hanson-Young’s mythical economy we become a nation of bio-ethical kitchen renovators. We make money apparently because people like us. We put love and good thoughts on the boats that used to export our coal. I can say that because the Greens really do want to close down the coal industry. It is no good Labor saying that it doesn’t want to shut down the coal industry when your coalition partner says they do. If you don’t want to do that why did you sign the registry book, witnessed by the Australian people, remember, the shot where Bob had the corsage in his lapel. 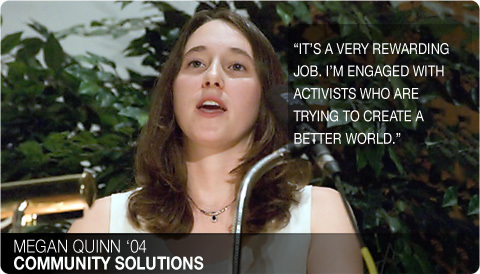 Strangely enough, Meghan Quinn – the chief of the (Treasury department’s) Climate Change Modelling Unit – has a remarkably similar, eagerly naive, fresh-faced blind faith look about her as our dear Sarah Hanson-Young (SHY). As you will see, when you click on that link above. Hold on to your sides, and keep liquids clear of the keyboard first. Senator JOYCE: Just out of curiosity, Dr Nigel Ray calls it ‘climate change modelling’. So, of all the other things, did you model how much the climate was going to change; and, if so, how much will it change? Ms Quinn: Perhaps I could take that question. The Treasury looks at the economic implications of climate change mitigation, and we have been very clear about that in terms of the skill sets and the types of analysis that we look at. We do not look at the science of climate change. We have not looked at the implications of climate impacts on the Australian economy. Senator JOYCE: Do any of these models give any sort of prediction about any sort of change in the climate? Ms Quinn: That is a question you would have to ask a climate scientist. Senator JOYCE: Why do you call it ‘climate change modelling’, if you have no idea of what it is going to do to the climate? Ms Quinn: We call it ‘climate change mitigation modelling’. Senator JOYCE: So how much is it mitigating the climate by? Senator Wong: Senator, those questions should go to Climate Change. Senator JOYCE: I am just curious. It just seems peculiar to go through all of these things and they do not actually do anything for the climate. You ‘aint seen nuthin’ yet. Barnaby has questioned Ms Quinn before. On the important topic of all those “green jobs” we’re supposedly going to see. Senator Barnaby Joyce: In your modelling as you transfer people into jobs, where were those jobs, Ms Quinn? Meghan Quinn: The general shift from higher intensive emission industries to lower intensive emission industries. So there is a table on 6.12. SBJ: Give me an example of the Top 3. MQ: Increases in the electricity supply for renewable energy. SBJ: The supply for renewable energy, so what are those people doing? MQ: The supply of renewable energy covers all types of energy, hydro, wind, geothermal potentially by 2050. SBJ: These people want to turn up to work what are they actually doing. What do they look like, are they construction workers, are they electricians, are they accountants? MQ: The actual electricity supply … the people working in the industries. People who are looking after the production of the actual wind farm, the operation of the wind farm. The construction component would be captured by the construction sector. SBJ: What is the person who is operating the wind farm? What is he or she doing? MQ: I am not a technical engineer so I don’t think I can answer that question. SBJ: Have you been to an actual wind farm lately? MQ: I’ve seen a wind farm, yes. SBJ: How many people did you see working there? MQ: Well there was a person taking me around. MQ: Well I don’t know. There must be some. SBJ: Been out to a coal mine lately? SBJ: From what you have seen on television does it seem like many people working there? MQ: There has a been a reduction in the share of people working in the mining industry generally. SBJ: What’s your next big one? SBJ: Forestry? OK, so what are the people doing there in forestry. What are the people doing there? MQ: I presume they are looking after trees. SBJ: Have you been to a forest lately? SBJ: Did you see many people wandering around there, any people working? MQ: I am not an expert on the particular industrial structure of these industries. SBJ: What’s your third one? MQ: They are spread over a number. Other manufacturing. SBJ: What are they actually manufacturing in the other manufacturing? MQ: A whole range of manufacturing. I can give you a breakdown. I would have to check the categories. I know what it is not. I know it is not motor vehicles, metals or metal products. SBJ: Can you think of anything they would be manufacturing in the other manufacturing? MQ: I would have to take it on notice. SBJ: I am just going looking for those green jobs, I have to start finding them now. MQ: Employment redistribution in the employment model is not necessarily what you would think of as green jobs. There are shifts in employment in what you might not think of as green jobs as we move from high to low emission industries. SBJ: That’s constructing wind towers? MQ: There is a reallocation in the Australian industry from high emission to low emission. It doesn’t necessarily relate to renewable energy, it’s simply producing goods that are low emission. SBJ: It stands to reason. You take someone out of a mine you give them a brush cutter and tell them to start to wander around the forest. This is all fanciful. The mind boggles, does it not. It is just these kind of disconnected-from-reality, parallel-universe-dwelling, ivory-towered, holier-than-thou, commonsenseless, flittering pixie JAFA theorists who are getting paid a fortune – using our tax dollars – to “model” the legislation that will determine our future.